Direct Mail 5 is Here! This year marks the 15th anniversary of the launch of Direct Mail 1.0. It is remarkable to consider all that has changed since 2002, and what better way to mark this milestone than by releasing our latest and greatest update: Direct Mail 5.0! This is a big one. In this release, we revisited and revamped many of the core features that you use most often. There are, of course, new features, but the primary goal was to make your every day experience using the app even more productive and enjoyable than it is now. We hope you find that these changes save you time, save you headache, and help you stand out from the crowd. In this blog post, we take a look at a few of the notable improvements. 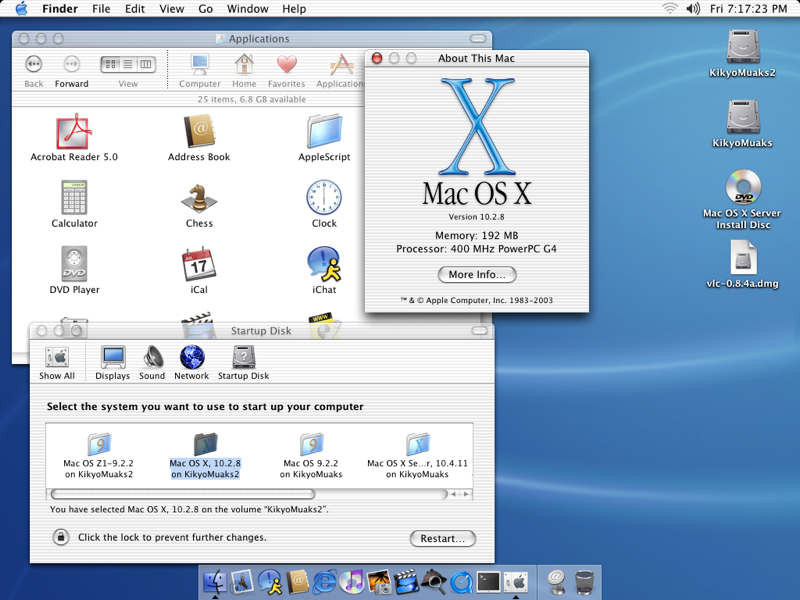 Instructions on how to upgrade (for free!) can be found at the end. Direct Mail’s template editor has always been easy to use, but it was not as flexible as some customers would have liked. The new editor retains that ease of use, but allows for much for customization. It is super easy to add, remove, rearrange, and customize each and every element of our new, modern templates—all with the peace of mind that unlimited undo brings. You can even build your own templates from the ground up, no HTML knowledge required. 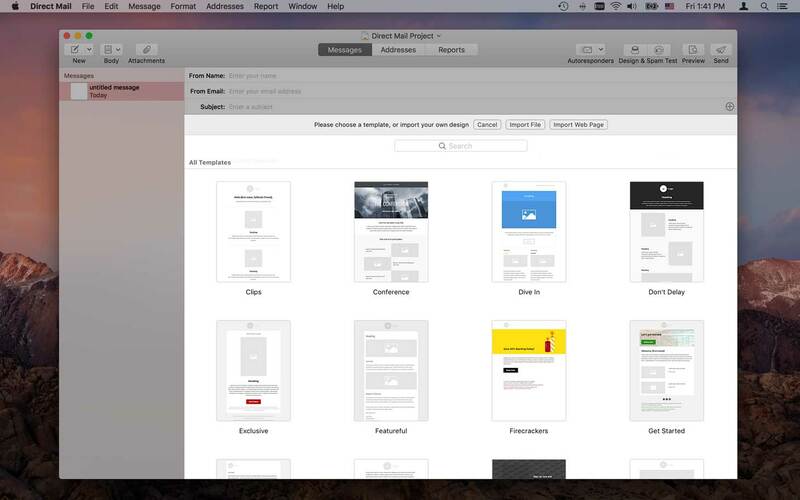 Images, text, video, buttons, and more can be dropped into a variety of layouts with one click. New text styles will help your message retain consistent, clean formatting from top to bottom. Unlike before, templates built with the new editor will look great on all screen sizes, and even adapt to notoriously difficult email clients like Outlook. Professional typography and color selections will make your content stand out in a crowded inbox. Power users can take advantage of new conditional sections that show or hide their content based on the recipient or device the message is viewed on. Direct Mail 5 ships with over 50 brand new modern templates, each one 100% customizable, and each one optimized for popular desktop, mobile, and web email clients. You are sure to find a template that fits the occasion. Already have a favorite template? No worries, all of your existing templates are still available in the app. Speaking of finding templates, the new template chooser features larger thumbnails, a bigger viewing area, and a search box for easier navigation. Direct Mail has long supported useful integrations with third-party apps and web services, but those integrations were not always easy to discover. 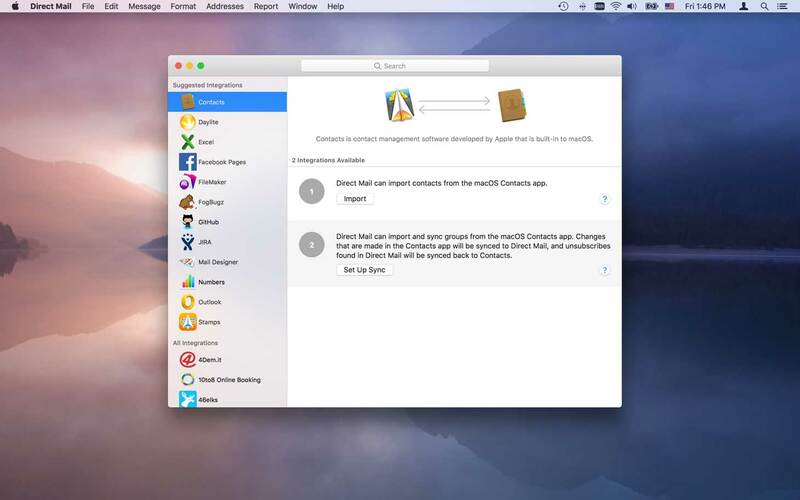 New in Direct Mail 5 is a one-stop-shop window for discovering all the ways that you can connect Direct Mail to the other apps and services you already use. Nobody likes manually syncing mailing lists, or doing repetitive work that could be automated away. Take a look in the new Integrations window to see if an integration already exists that could save you time. And if you don’t see one fits your needs, please let us know! 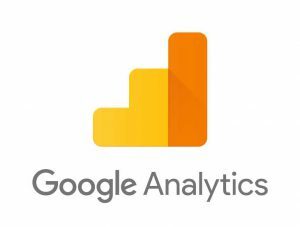 While we’re on the topic, one notable new integration is Google Analytics. Now when you send an email campaign, you can automatically have the links in your message tagged for Google Analytics. If you use Google Analytics on your website, this can give you greater insight into what email campaign links are driving visitors to your site. If an image or logo in your email needs a few tweaks, there is no longer any need to find a designer or figure out an image editing app. 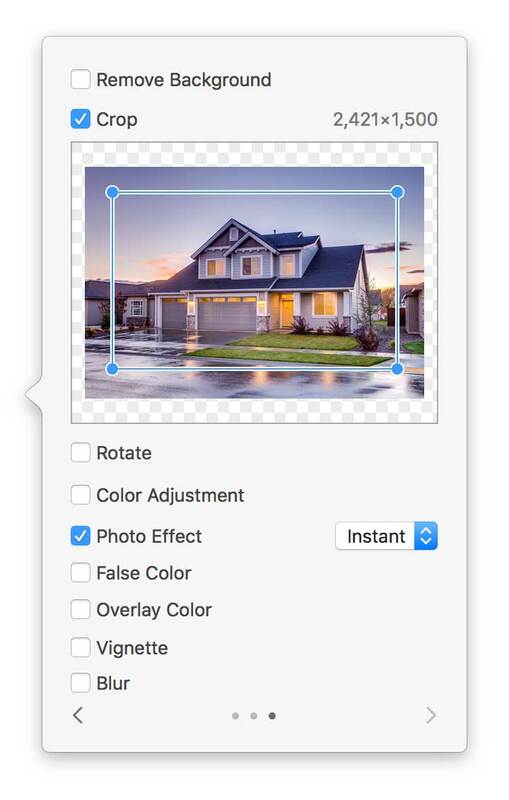 Direct Mail makes it easy to perform a variety of common image editing operations, like removing backgrounds, cropping photos, or adding filters. With just a few clicks, you images will look their very best. 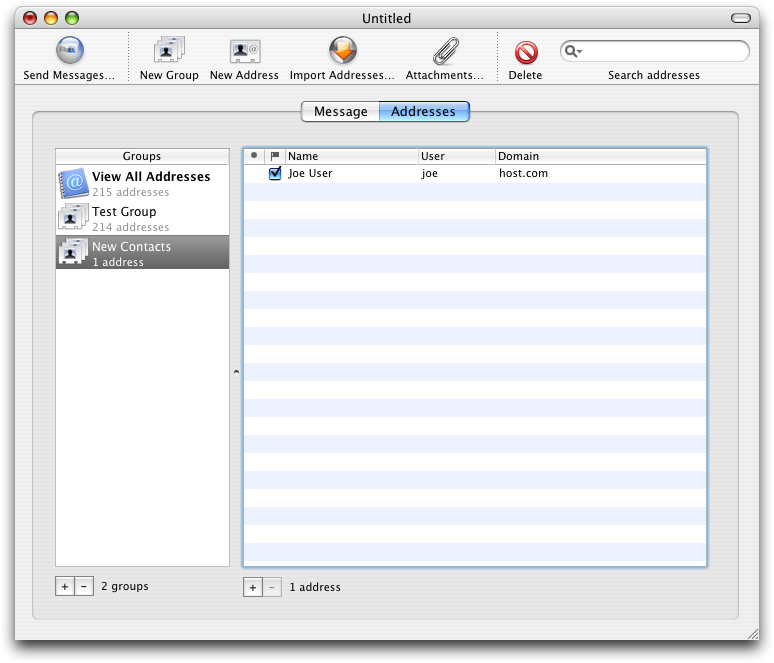 The Design Test tool has been revamped to give you precise control over what email clients to test (over 50 available! ), to return screenshots up to 4× faster, and to allow quicker and easier navigation of your test results (including zoom and gesture support). What’s more, design tests are now included for no extra charge in both the Unlimited Plan and the Pay Per Email Plan! You’ll sleep better knowing your latest and greatest design looks as good in Outlook as it does in Gmail. One of the improvements that we are most excited about is one you cannot see. Direct Mail 5 brings big performance gains when working with larger lists, and big speed boosts to the cloud sync process. You should notice a snappier experience and less time (or no time) looking at a spinning beachball. An enhanced Spam Test window now helps you find and fix more mistakes (like bad or missing links) before they are sent out to your entire list. Importing Excel files is now faster and easier—no CSV required. Autoresponders can now be saved as drafts and duplicated, for easier creation of multi-step automation workflows. Handy editing and navigation options now appear in the Touch Bar (on supported Macs). Social sharing options have been expanded, and you can now customize how your email is displayed in social media feeds. Two-Factor authentication for your Direct Mail account is now supported for tighter security, and custom DKIM signing keys can be set up for your email campaigns. 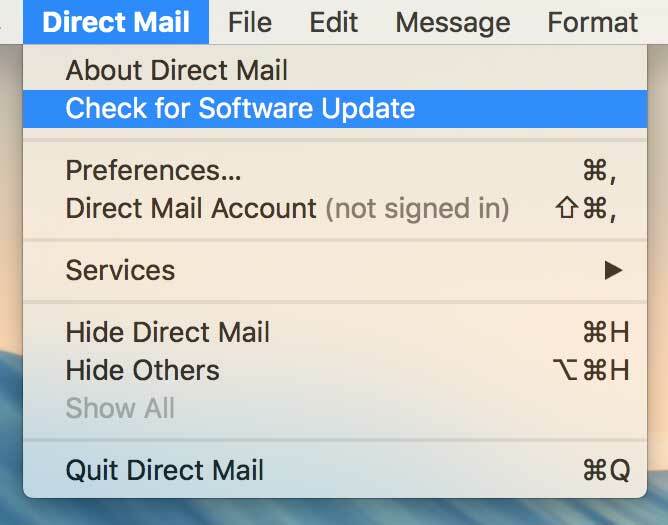 Direct Mail 5 is available immediately, at no extra charge, to all of our customers who are running macOS 10.11 or newer. To upgrade, open Direct Mail and choose Direct Mail > Check for Software Update from the menu bar at the top of the screen. If you’ve downloaded Direct Mail from the App Store, your Mac will update automatically (or you can check for updates in the App Store app). 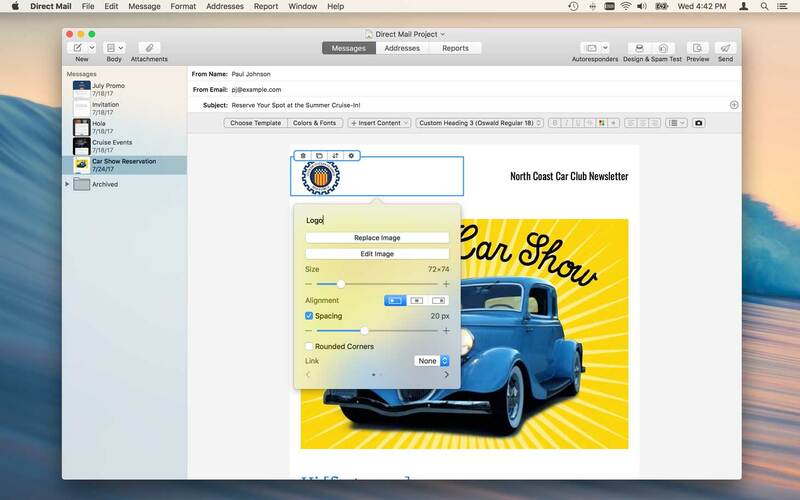 Direct Mail 5 is fully compatible with the forthcoming macOS High Sierra. If you’re new to Direct Mail, you can download it now (for free!) by clicking the Download Now button at the top of this page. One thing that has not changed since 2002 is our commitment to help customers grow their businesses, inspire their communities, and expand their reach through excellent email marketing tools. We hope you find that this update helps you accomplish those goals even faster. We also want to sincerely thank each every one our customers for making the past fifteen years possible. We literally could not have done it without you. Here’s to 15 more!